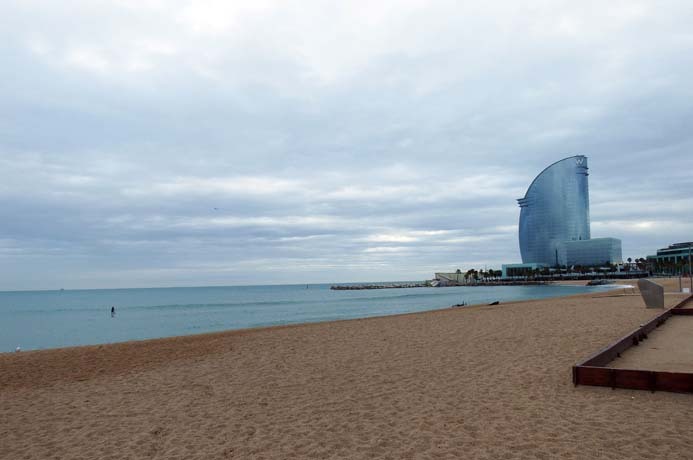 The W Hotel Barcelona is a striking building of steel and glass that stands proudly at the end of La Barceloneta. It is reminiscent of a sail, hence its nickname, Hotel Vela (Sail Hotel). 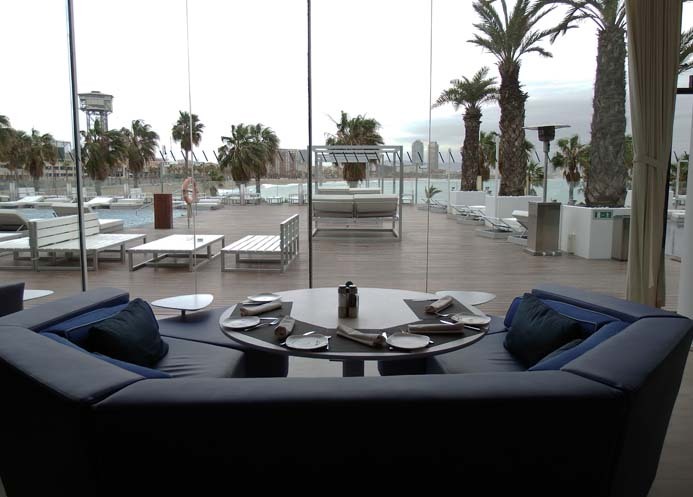 The W Hotel Barcelona is a beacon for the fit, fun and fabulous locals and the luxury tourists. It is the trendiest and Instafamous hotel in Barcelona. 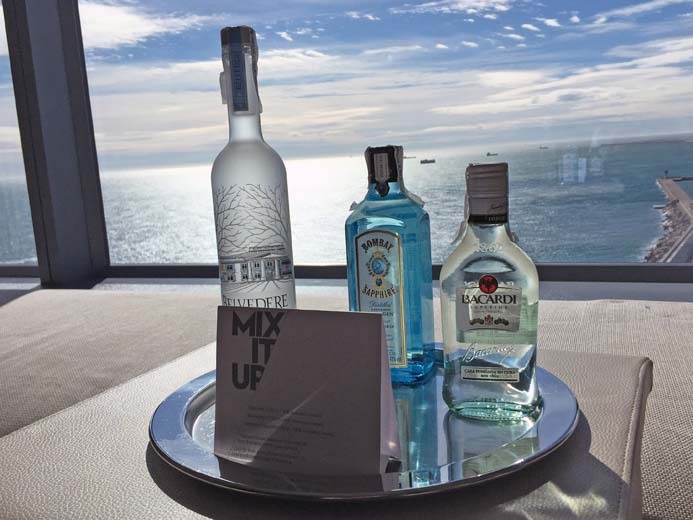 There are over 55,000 photos with the hashtag #wbarcelona and #whotelbarcelona on Instagram. There is a good reason for that too. 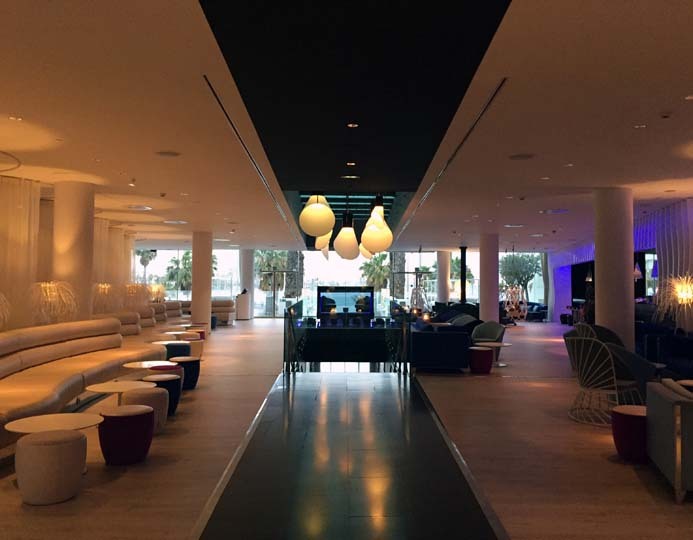 The inside of the W Hotel Barcelona is just as striking as its exterior. The contemporary interior design is alluring and inviting. It looks picture perfect from every angle and it is almost impossible to stop taking photos of every little detail. 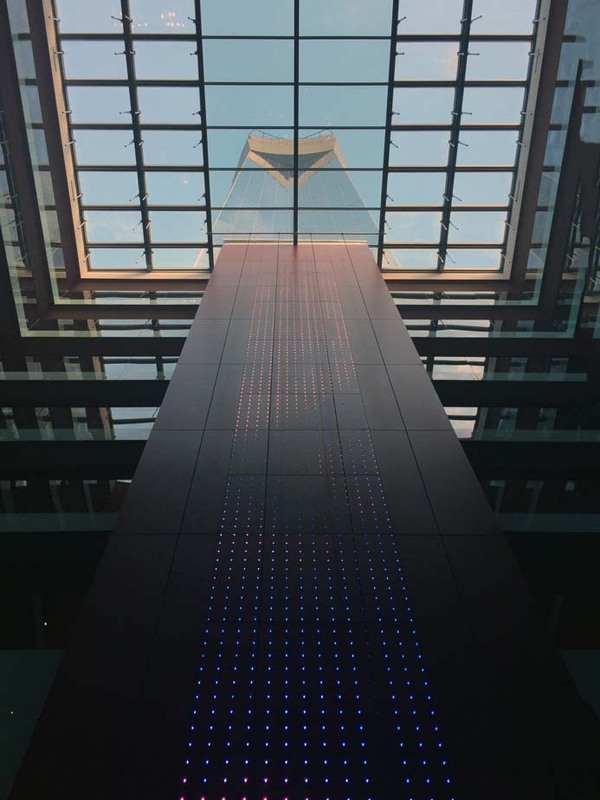 When you strut, yes strut, into the lobby you are greeted not only by hip, good-looking staff but also by a hip atmosphere with mood lighting and upbeat music. From the lobby, you can keep on strutting into the W Lounge area with its Carnovsky graphics that transport guests through layers of colour into a vibrant world filled with relaxing armchairs, sofas and swinging wicker chairs. Giant feather lamps add to the opulent feel. You cannot help but get swept up in the glamour of it all. Pull up a chair and let the cool bartenders mix you a drink as the DJ mixes some house music. Further toward the end of this area is the signature Living Room which is the ideal place to sample an eclectic mix of cocktails and Spanish and Mediterranean tapas as well as an extensive choice of fish, poultry and meat dishes all served with panoramic views of the Mediterranean Sea. From here you can gaze out at the wet pool and terrace area with its pristine white sofa loungers and palm tree-lined pool. This place looks like a million-dollar music video. There is yet another bar on the 26th floor of the hotel called ‘Eclipse’. 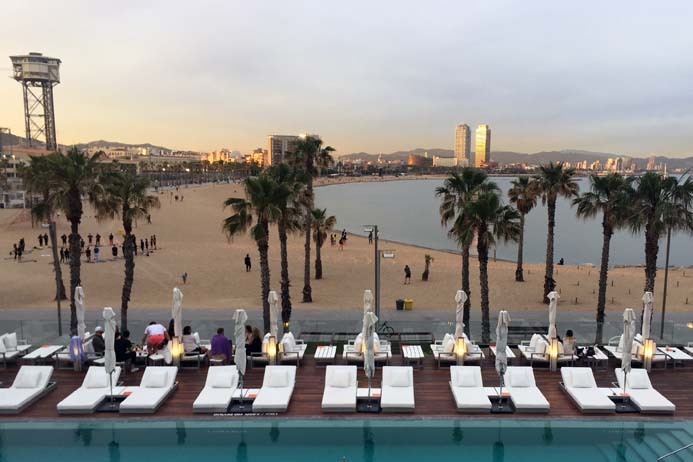 It is the best place in Barcelona to watch the sunset over the sea and the city as you sip on a fancy cocktail and nibble on modern food including tempura, ceviche and sushi. Up the glamour even more by soaking up the sun on the aptly named sun deck with its private infinity pool where not only is the water’s edge endless but the beach and sea views are too. You can rent a cool private cabana here too, handy if the paparazzi won’t leave you alone. For those who like to work up a sweat on holiday, (not me) there is a fitness centre that offers fabulous views of Barcelona’s coastline while you pump iron. Or you could just join the locals on the beach for a run or sunrise/sunset yoga session. Fancy a facial or massage? Head to the extensive Bliss Spa and check out the retail beauty boutique, the two manicure and two pedicure nail stations, eight treatment rooms and men’s and women’s lounges for post-treatment relaxation. Bliss also features a steam room, sauna and indoor Jacuzzi. 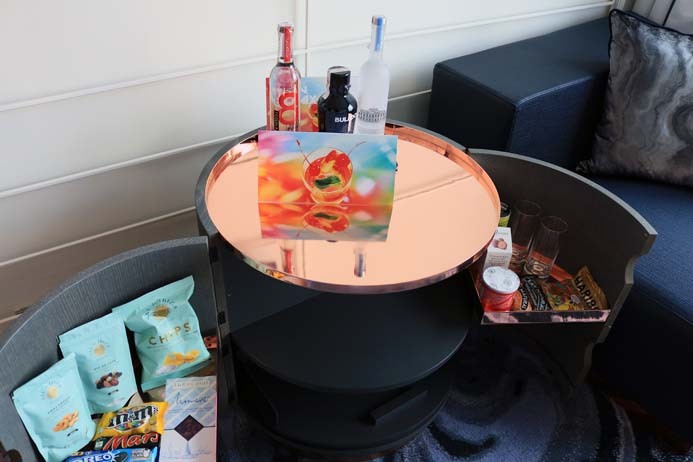 After all that fabulousness, it’s now time to check out your room, or suite if you are lucky. 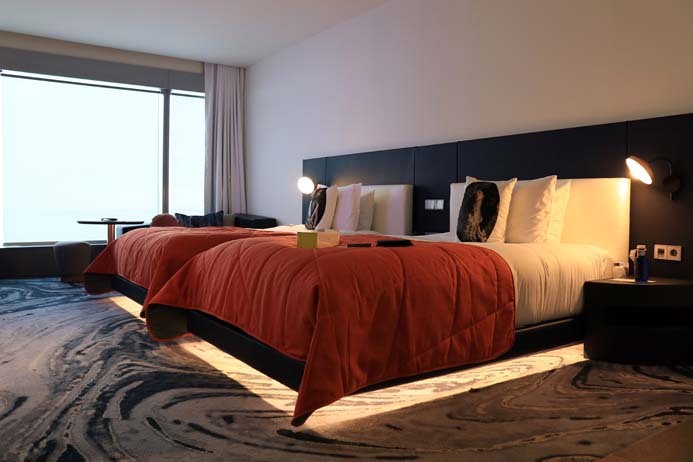 There are 473 bedrooms and suites in the W Hotel Barcelona. The rooms fall into ten categories, ranging from ‘cosy’ to the ‘extreme WOW suite’ (from €11,000 a night). No, that wasn’t a typo. Brace yourself. Prepared to be wowed. 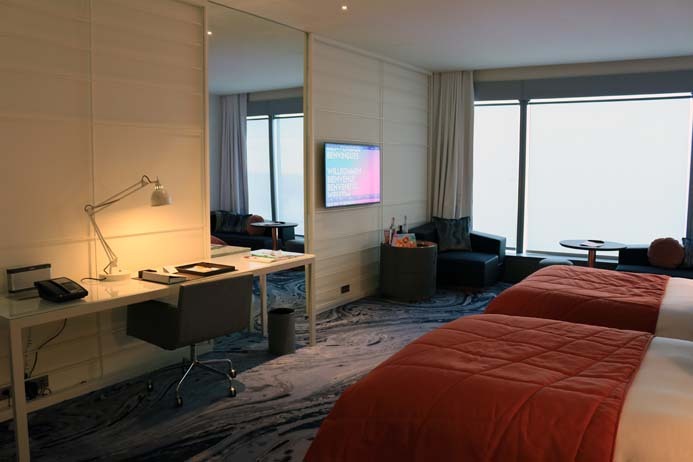 The bedrooms in the W Hotel Barcelona are breath-taking mostly due to the floor-to-ceiling windows that offer a majestic panoply of mountains, Mediterranean and marina. The first room type I stayed in was the Wonderful Sky Room (Sky Rooms are rooms located above the 15th floor). This room was dominated by a huge and comfortable king-sized bed that directly faced the floor-to-ceiling window. I slept with the curtains open that night so I could wake-up to the sunrise over the water. However, the bed was so comfy I slept through the sunrise and didn’t wake up until the alarm went off. Let me just take a minute to talk about the ‘Signature W Bed’. 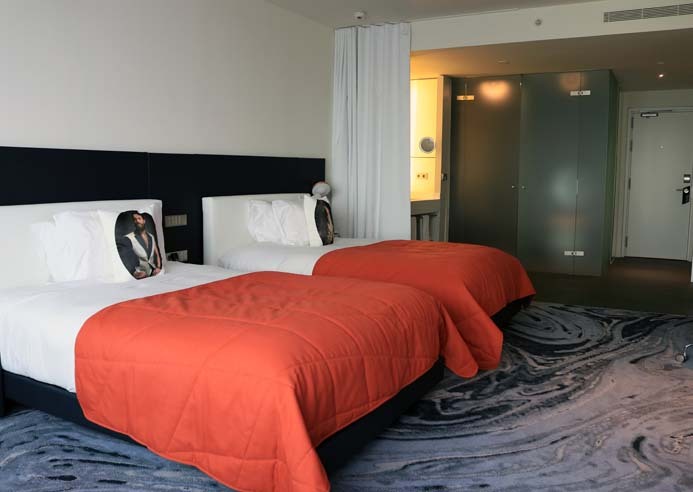 It is an elevated cocoon consisting of a plush pillow-top mattress, feather duvet, 350-thread-count linens and stylish accent pillows, which portray iconic personas like Gaudi, Dali and Saint Eulalia, the co-patron Saint of Barcelona. (I had to look that up). The second time I stayed in the W Hotel Barcelona I was in another Wonderful Sky Room but this time it was a twin room and the beds faced the TV. 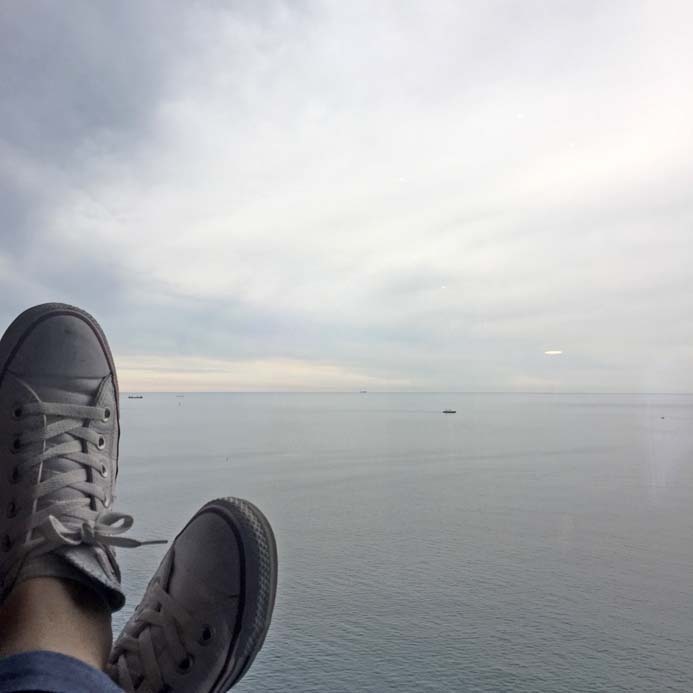 However, the floor-to-ceiling window had a cushioned bench running its length so you could relax and watch the ships sail by. I thought the ‘single’ size beds were rather large. They looked more like small doubles. I didn’t miss the king-sized bed at all. 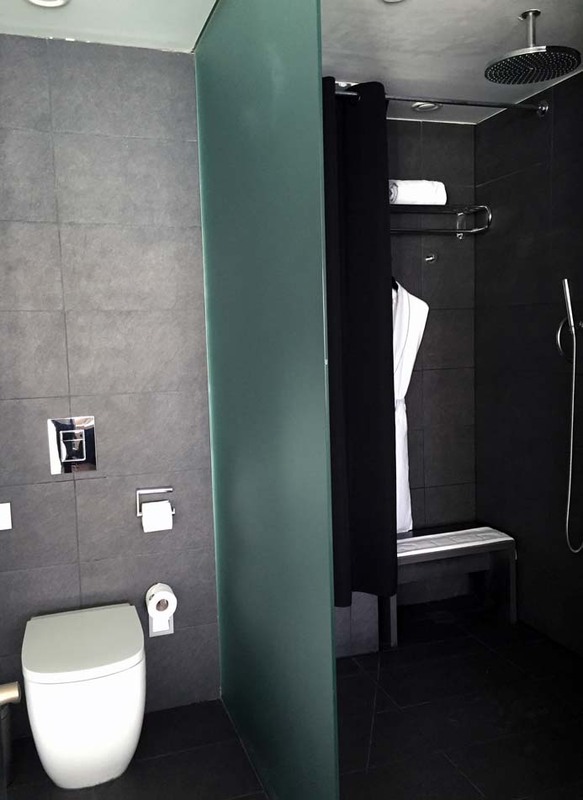 The large shower room has a seat so you can relax under the rain shower after your hard day chilling by the pool. The W Hotel Barcelona supplies more toiletries than any other hotel I have stayed in. The toiletries are from the Bliss spa and are wonderful. The facial wash is fab. Save room in your toiletries bag to take them home with you. Come on, I’m not the only one who takes them home. There are loads of fluffy towels and a robe and slippers and a powerful hairdryer too. Bonus. All rooms feature a 49-inch flat-screen TV with loads of decent channels. There is also an iPod docking station and Bose Bluetooth sound systems as music is very important in this hotel. 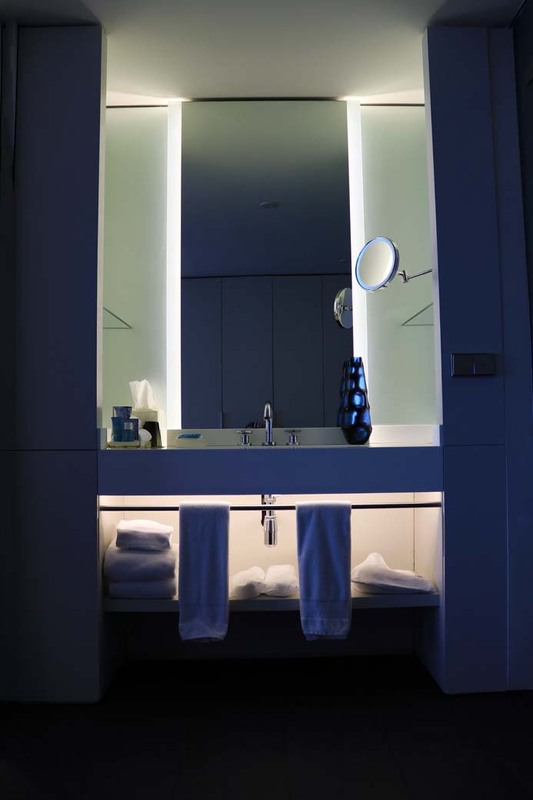 You can adjust the mood lighting in the room to create the ambience that you wish. There is also a Nespresso coffee machine and tea-making facilities, mini-bar, munchie-box, safe deposit box, iron and ironing board. There is a large desk with plug sockets and USB points as well as three-pin sockets too for those who forgot to bring a travel plug adapter. The Wi-Fi is fast and stable, too, great for me as, unfortunately, I had loads of work to do when I was staying there. 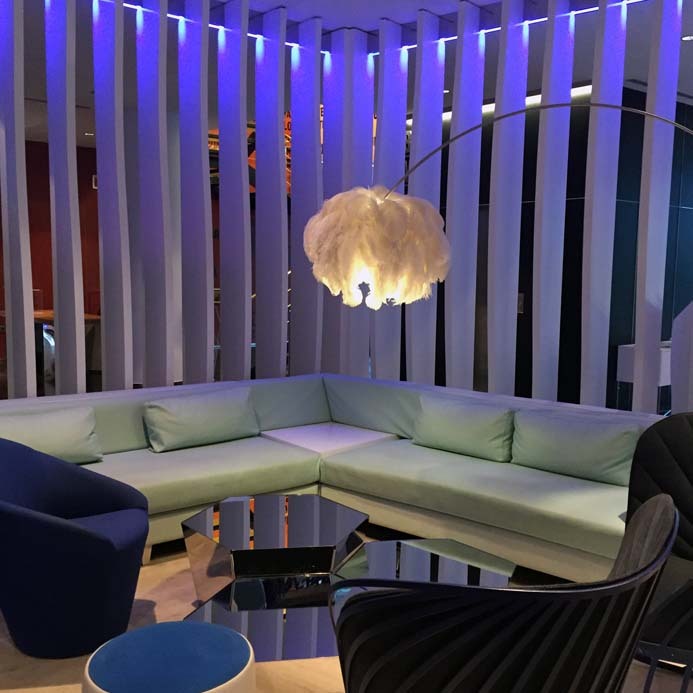 After you have run around your room in excitement and smelled all the toiletries, and looked at everything in the mini bar and admired the view and taken a million photos, it’s time to hit the lounge, or bar, or restaurant or the city of Barcelona. Now, here’s the thing. 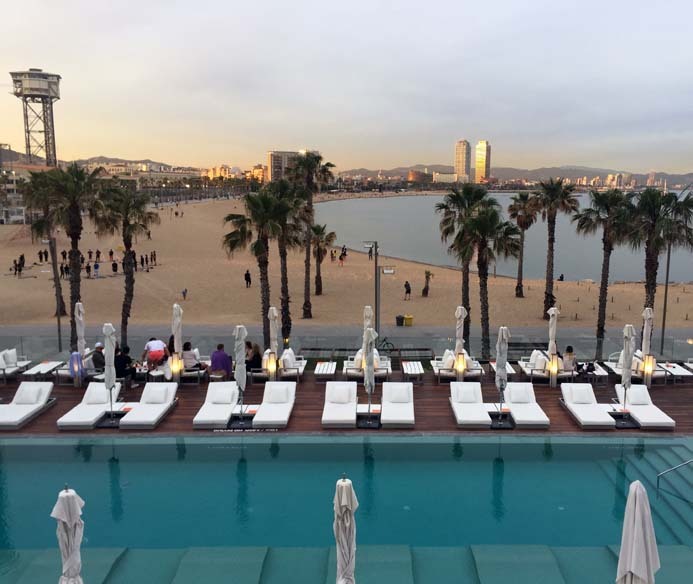 The location of the W Hotel Barcelona is perfect for a beach holiday. 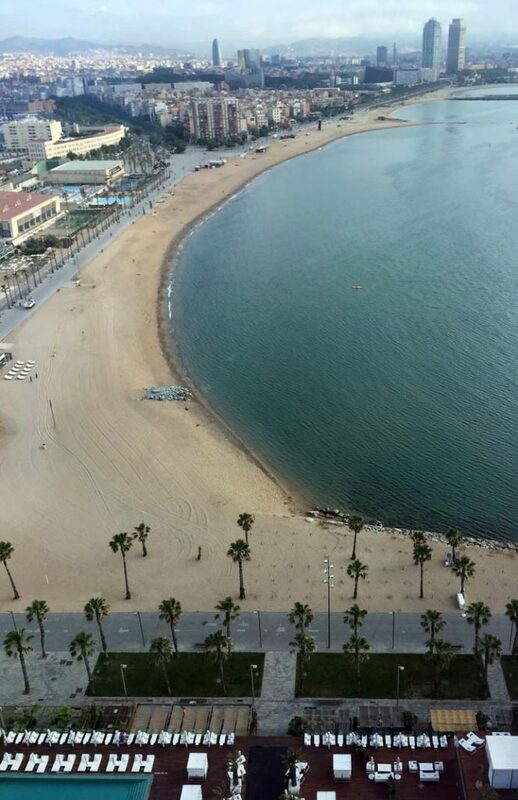 Even has it has its own private access to Sant Sebastià Beach. It’s also just a ten-minute stroll from the marina and restaurants of Passeig de Joan de Borbo. However, it’s about twenty minutes from the old town of El Born and about 3km away from La Rambla, the main tourist area. You can walk to La Rambla and La Boqueria food market in less than 30 minutes and the walk is quite enjoyable. A taxi will take about 15 minutes. Failing that, the W Hotel Barcelona is about a twenty-minute walk from the Barceloneta metro station where you can catch a metro to the Ramblas, Plaza Catalunya, the Sagrada Familia and Parc Güell. 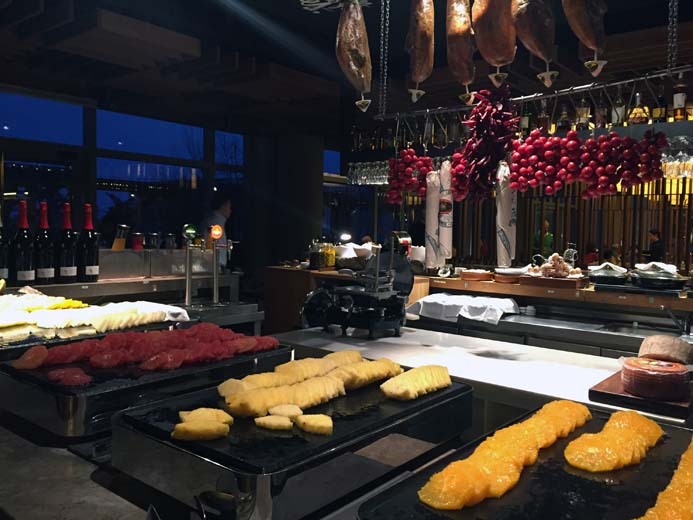 The W Hotel Barcelona spoils you with choice when it comes to food. My top thing to do in Barcelona is to visit La Boqueria food market. But if you decided to eat at the W Hotel Barcelona apart from the areas already mentioned, you can also dine at Bravo 24. 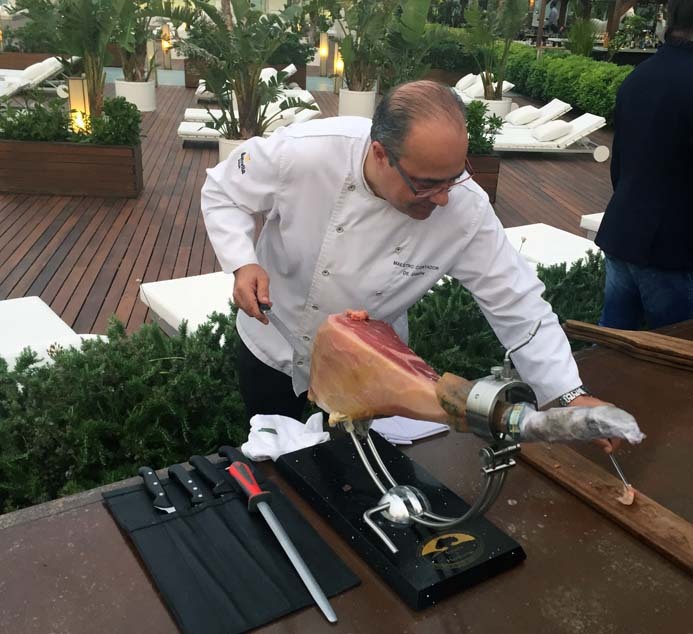 At Bravo 24, Catalan chef Carles Abellán creates culinary delights using fresh, seasonal local ingredients. 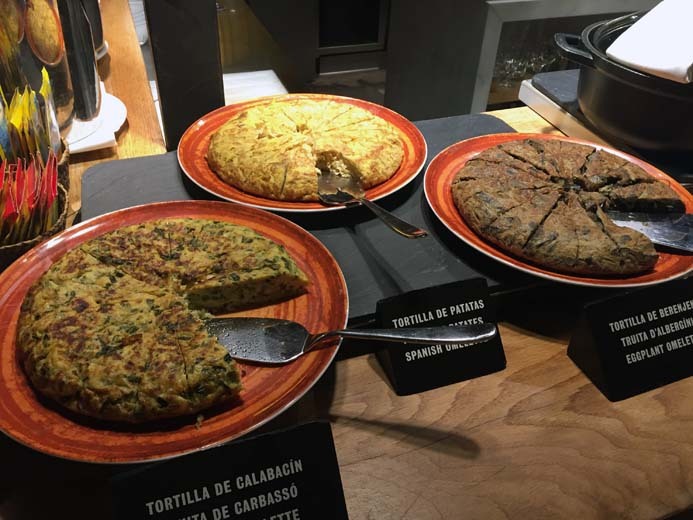 Abellán, along with food historians, made a thorough study of the food of Barcelona and has designed a menu based on the city’s cuisine. You can enjoy this culinary experience in one of the private dining spaces or on the terrace overlooking the sea. Bravo 24 is also where you’ll have breakfast. And what a treat it is. 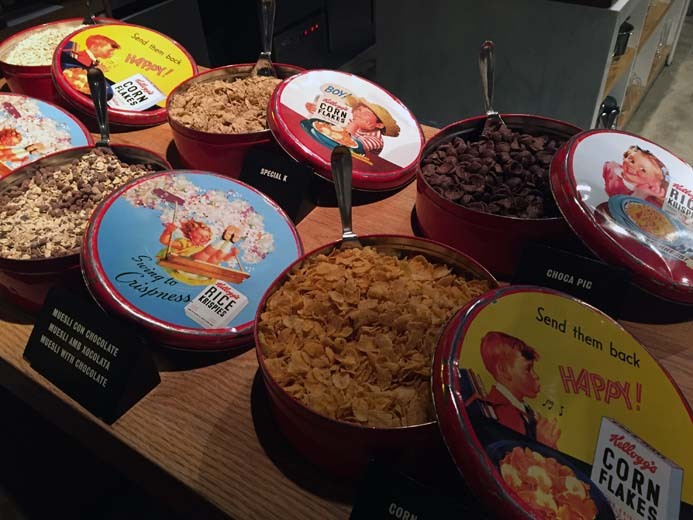 As you all know, breakfast is my favourite part of any hotel stay and the breakfast in Bravo 24 is epic. 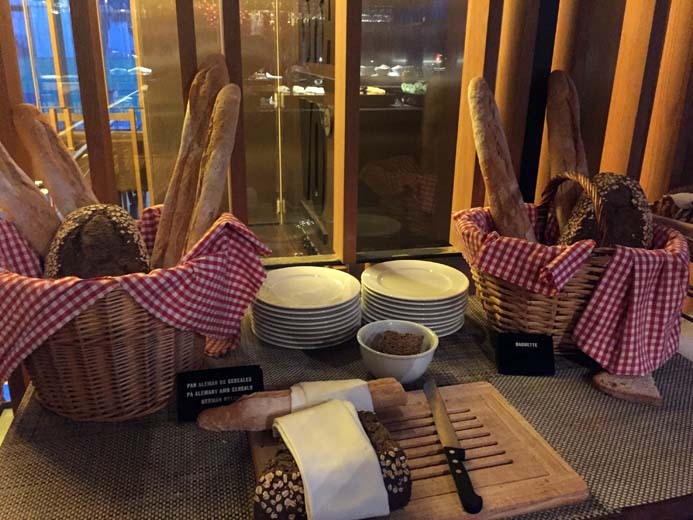 You can choose from over 130 items from the buffet and “a la carte” menu. 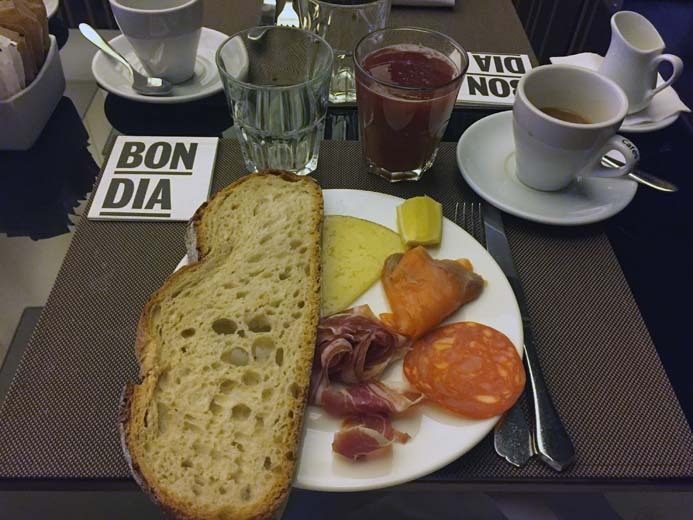 For me, breakfast at Bravo 24 in the W Hotel Barcelona consists of a frothy cappuccino and fresh juices. I follow this with a fresh fruit salad with homemade granola and organic yoghurt. Then I move on to the eggs from the hot menu. I follow this with some excellent local cheeses, meats, tortilla and fresh bread. No, seriously, I am a horse when it comes to buffets. When I have had my fill of the savoury stuff I head to the cake table. 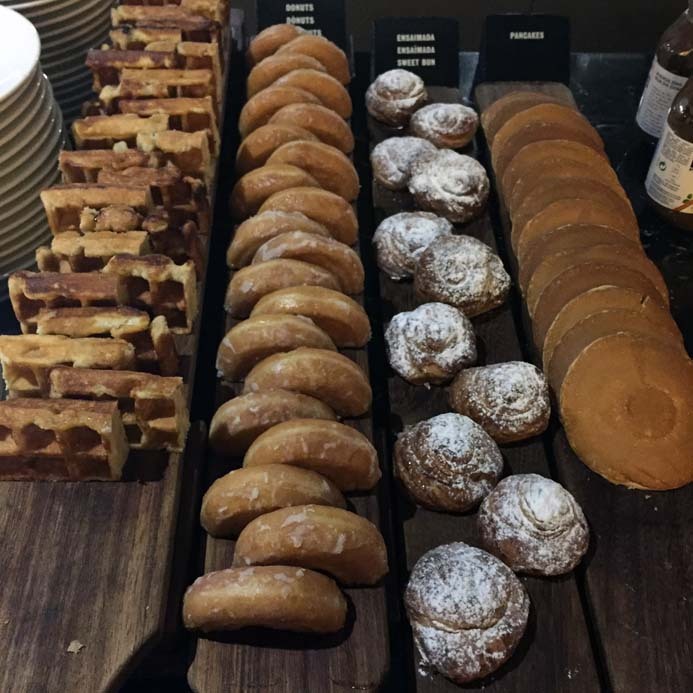 Usually, I then have a sweet doughnut and whatever ‘foreign’ bun or muffin that is on offer. I then roll out of the restaurant and find a comfy corner. I wait here and chill out and wait until my food coma passes. If you want to combine a city break with a luxury beach holiday the W Hotel Barcelona is for you. Especially if you enjoy plenty of pool time and pampering and fabulous food and cocktails. However, you should consider a different hotel if you want something with a more Spanish and local vibe. This is also the case if you want a hotel that’s a bit closer to the main tourist attractions. 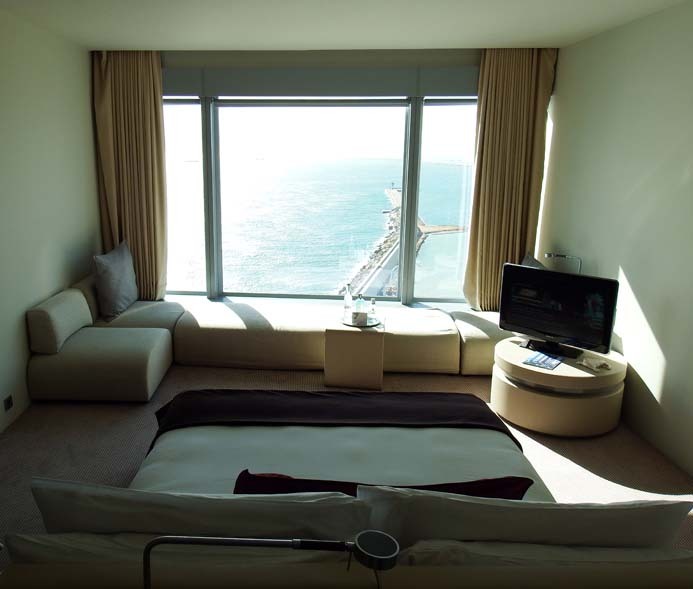 You can check out the W Hotel Barcelona and the room rates via its website, here. What’s is your favourite hotel in Barcelona? Let me know in the comments below. If you liked this hotel review you may also like my review of the Finn Lough Bubble Domes in Northern Ireland. You might also like my review of the Abbeyglen Castle Hotel in Galway, Ireland. If you are going to Barcelona, check out my top thing to do in the city – La Boqueria food market Barcelona. 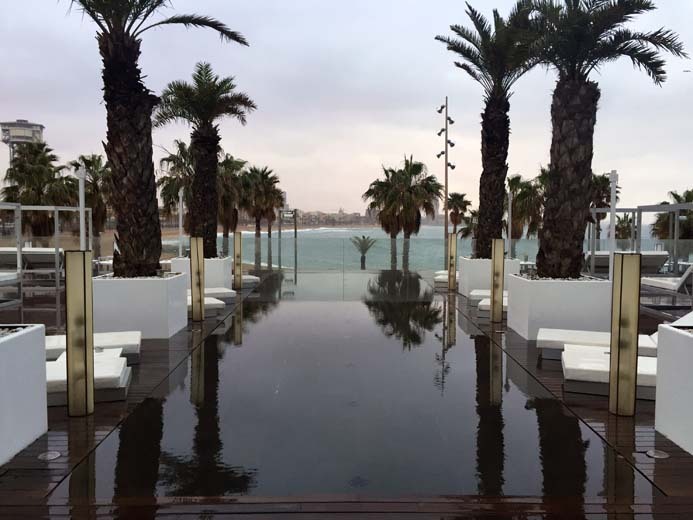 If you liked this W Hotel Barcelona review, please share with others. Yeah they really are. I’d love to stay in the one in New York to see what it is like. I haven’t been there but I’ve heard a lot about this hotel. It’s spectacular! Oh if you do get a chance to go you will love it. Even just having a cocktail in the lounge is a great experience. I came here when I went to Barcelona – so beautiful! Yes, it is. What did you love most about it? I swear they have the comfiest beds of any hotel! But I say that about every hotel. I just want to live in hotels. That architecture is stunning! Love the floating beds too. The floating beds are very cool especially at night when the room is dark and the only lights are the under bed lights. The room feels magical and very futuristic. The hotel looks absolutely amazing. I love the room with the bed facing the water – absolute bliss!! (Which reminds me, I always take the toiletries with me too he he). My bathroom at home is overflowing with miniatures but it makes me feel like I’m in a hotel when I’m just at home. 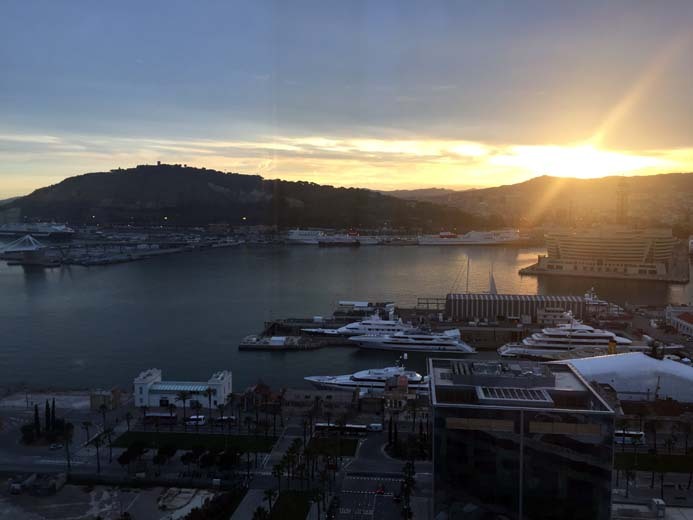 Delighted to read this review, as I love the W Barca – easily one of my 5 best worldwide hotels (and I’ve stayed in lots!). Such a cool hotel, by a cool brand, in one of the coolest cities around. There’s so much to rave about with the W. Nice to be reminded of Bravo 24; really enjoyed eating there at night after the amazing Wet Deck pool parties. Thank you for sharing, and keep up the great work! Thank you. Would love to know what hotels you rate the best? I’m always looking for new hotels to stay in. Hi Kiki, it is an incredible hotel both outside and inside. From reading your blog I think this hotel would be perfect for you!